Kyiv, 10 December: Ineffective legislation, police officers’ indifference and complicated legal procedures impede efficient system of domestic violence prevention and combating in Ukraine, a new UNDP-led study suggests. Researchers concluded that money would be better spent on increasing funding of social services and other public institutions dealing with domestic violence. The research was presented on the occasion of the International Human Rights Day observed globally today. Ineffective legislation, police officers’ indifference and complicated legal procedures impede efficient system of domestic violence prevention and combating in Ukraine, a new UNDP-led study suggests. Researchers concluded that money would be better spent on increasing funding of social services and other public institutions dealing with domestic violence. The research was presented on the occasion of the International Human Rights Day observed globally today. The UNDP-led researchers worked on the Assessment of Ukrainian national system of prevention, response and combating domestic violence. It was conducted on the request of “Equal Opportunities and Women’s Rights in Ukraine Programme” (a joint European Union, UN Development Programme and the Swedish International Development Cooperation Agency (SIDA) Project). Commenting on the new study results, the Gender Department Director at the Ministry of Ukraine for Family, Youth and Sports Ella Lamakh praised the uniqueness of such a complex and analytical study – as it was never done in Ukraine before. There were only separate efforts made on the local level or topical studies with narrow focus. She expressed her confidence that the results of the experts’ work would open a serious discussion at the level of Government and Parliament as to the necessity of the respective amendments to be introduced into the national legislation in order to improve the national mechanisms of prevention and response to the domestic violence. UNDP Deputy Resident Representative Joanna Kazana-Wisniowiecka underlined that domestic violence has been a burning issue not only in Ukraine, but internationally: in response to this, the UN Secretary General Ban Ki-Moon announced the global campaign “UNite to end violence against women”, which lasts till 2015. Joanna Kazana-Wisniowiecka said that although Ukraine became the first country of former USSR to adopt the “Law on prevention of domestic violence”, the country still lacked effective mechanisms to support victims and protecting their rights. She also noted that UN Development Programme actively supported the work of experts’ team, because their research should become the first step on the path of institutional and legislative reform aimed at solving violence problems in Ukraine. Experts stressed that the Criminal Code of Ukraine lacked a basic definition of domestic violence. Indeed, domestic violence is classified as a ‘physical’ or ‘sexual assault’. Experts recommend adding a specific clause regulating domestic violence: violence committed against a family member or a partner should be considered as an ‘aggravated assault’. 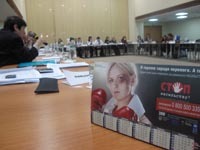 Sector Manager on Health and Welfare at the Delegation of the European Union to Ukraine Sergiy Polyuk stressed that domestic violence should be totally unacceptable in a modern state. “That is why European Union will continue to collaborate with the Government of Ukraine and UN Development Programme to lessen the level of violence”, he added. Polyuk said that the EU granted EUR 14 million to a number of projects supporting women’s and children’s rights in Ukraine. The presentation participants praised the UNDP-led and EU-funded Project's recent successes in organising a public information campaign, calling on survivors of domestic violence to speak out. The outdoor public service announcements within the national 'Stop Violence Campaign' received positive comments from both experts and the public. In the Project Coordinator Larysa Kobelyanksa's words, the number of callers calling the 'Stop Violence' hotline saw a massive increase. Over the past five years there were about 4,000 calls recorded there, while the hotline operators have reported 3,000 callers since May 2009 alone - when the outdoor PSAs appeared across Ukrainian cities. Svitlana Pavlysh, the Project’s Expert on Prevention and Response to Gender-based Violence, said that the researchers conducted an in-depth analysis of national legislation, police alert system and forensic medical expertise available to violence victims. In addition, they looked at what types of social works is performed on violence prevention, as well as, how they deal with perpetrators and which social services are offered to victims nationwide. The authors of the research also noted that the protective measures for victims (restraining orders, etc.) had a low efficiency level. In fact, the absence of the efficient penalty system undermines the overall impact of protective measures. Experts recommend improving the punishment system and reforming the protective measures clause. At the same time, experts reported that the police often were reluctant to intervene in domestic violence cases. Police officers often consider domestic assaults as ‘family affairs’ which are not worth interfering. They also try to discourage victims from declaring the assault and refuse to open a criminal case. The legal procedure for victims of domestic violence is rather complicated, especially the medical expertise. Institutions competent to conduct such expertise are usually located only in regional centres and have limited working hours. Experts also recommended that the Ministry of Health authorizes local hospitals and doctors to conduct medical assessments on domestic violence victims to determine their immediate wounds and woes. Overall, the experts pointed to a serious lack of sustainability within the national system of social services for victims of domestic violence. Moreover, social facilities able to provide help to victims exist in regional centres only. As for the rehabilitation programmes for perpetrators, experts have to conclude that such programmes exist, but there exists ‘no clear and well-structured system dealing with perpetrators’ in Ukraine. The research was carried out by a UNDP-commissioned international consultant Dr Robin Haarr and a team comprising a number of national experts: Volodymyr Stadnik, Expert to Assess Ukranian Legislation on Domestic Violence, Ruslan Riaboshapka, Expert to Assess Ukranian Legislation on Domestic Violence, Mykhailo Buromenskyi, Editing Lawyer to Assess Ukranian Legislation on Domestic Violence, Yuriy Onyshko, Expert to Assess Medical and Social Assistance to Victims of Domestic Violence, Laktionova Galyna, Expert to Assess Social Work System and Categories of Social Assistance to Victims of Domestic Violence, Ganna Khrystova, Expert for Research on Prevention and Correctional Programmes and System of Punishing Offenders of Domestic Violence, Olena Kochemyrovska, Expert for Research on Prevention and Correctional Programmes and System of Punishing Offenders of Domestic Violence.